This panel may be my favorite so far. I can just hear Nogg, sounding maybe like Animal from the muppets, in my head. Shuar talking to Dusty about Dmitri makes me laugh out loud. Nogg does have a very Muppet-like mouth. Oh man, now that you’ve said it, I can totally hear animals voice laughing right there. Now I can’t stop laughing. Nog looks oddly adorable laughing. But yeah, I can see how that would kind of happen, if everything is falling apart sometimes oblivion or at least a few happy moments is preferable to facing the enormity of what lays before you. I have to say that “… including its two moons.” “FWOOMP” “FWOOMP” almost cost me a keyboard. Just wanted to say, I finally finished going through the entire archive yesterday. My review: Your strip is brilliant, weird, and wonderful. You sir, have a new fan. I wonder how Nog got the Starbanger back off the Eebs? And muppet aliens are BEST aliens. My evidence: Farscape and Nexus. Spinnerette also has to drink a lot of protein shakes when she has to shoot web. I always say that if the house is burning down, sometimes the only thing to do is make s’mores. Some day, when Fantagraphics does the “Collected Christopher Baldwin,” they’re going to blow that frame up, add some ziptone, and slap that sucker on the cover of one of the volumes. Well, laughing nervously is better than stark raving insanity. I think I second your comment on the HA HA HA. P.S. : Typo in panel 4. You have “Eeb’s” path, which means there’s only one. “Greased dark light speed”… makes perfect sense to me. I’ve been reading your stuff way too long. Krep looks like he’s an angry drunk. …then again, he’s an angry sober, so perhaps there’s no noticeable difference. Maybe he’s just slower and less clever with his sarcastic comments when inebriated. The Keep looks awesome. the perfect view to lay back and watch the galaxy burn, like at the end of Empire Strikes Back. I can’t wait to get to know it’s quirky inhabitants. Also, the strips namesake is lost. how do we get back the Spacetrawler?! Wow, just days ago my RPG-group had a moment just like Krep and Nogg seem to be enjoying. “Out there in an apocalyptic storm, vicious beastmen brutally attack the rest of the city. Man, i spent three solid weeks writing that campaign. Maybe I should have eased up on the terror. I love how in the last panel, the light from the Sun has faded away. Nice touch. Wow, great idea,’well the universe is in extreme danger, what do we do?”How about we all get drunk?’Yeah”YEAH”Maybe”Eh, why not’. This comic is great, every moment of it has some worthlessly amazing story, joke, or character. 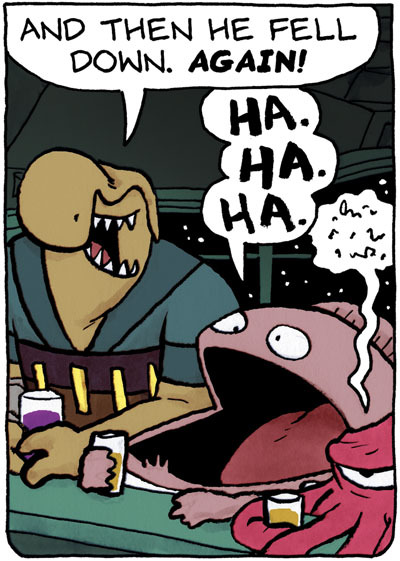 Guy who makes Spacetrawler, you are a genius. The Eebs Konk-ed that last one outta the park.